Classic bone-in Country Ham, aged 4-6 months and smoked with hickory wood. Partake in the full culinary experience of southern food with the Uncooked Bone-In Country Ham. 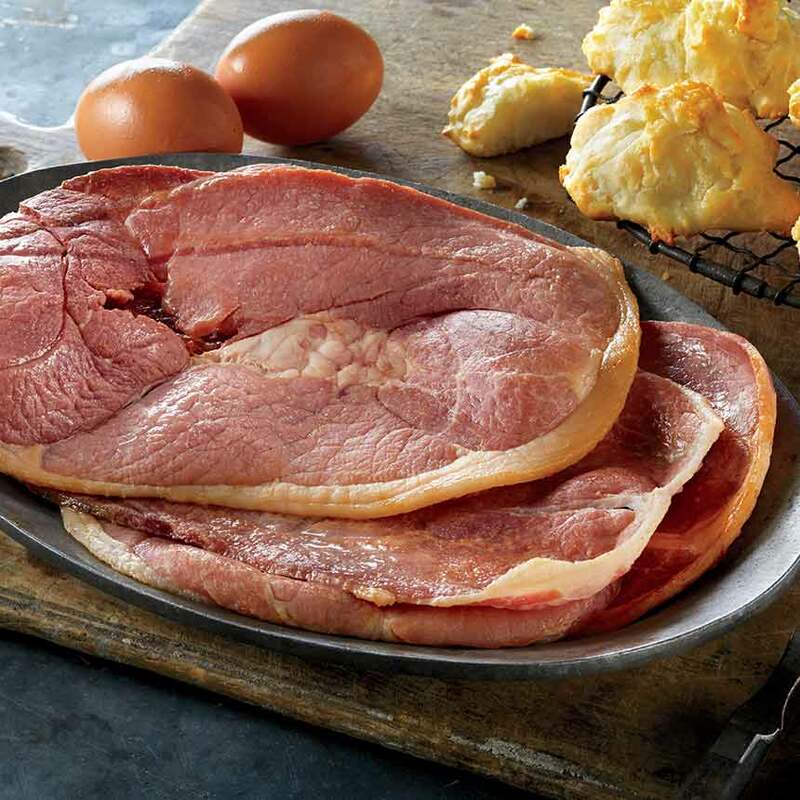 This country ham, which is dry cured, smoked with hickory and aged 4 to 6 months, arrives uncooked and ready for you and family members to begin a southern tradition; cooking a country ham for that special occasion. From preparation to the aroma of the ham as it's pulled out of the oven, let this country ham be the start to a new family tradition. Packaged in a vintage cloth bag, it's perfect for gift giving. Serves 52. NOTE: Because these country hams are produced in a separate facility from ours, which burned in the January 2016 fire, returning customers may experience a different and milder flavor profile than what they're used to with this ham. However, we still honor our 100% Satisfaction Guarantee. Thank you for your consideration as the recovery process continues. Ingredients: ham, salt, brown sugar, sodium nitrate, black pepper and sodium nitrite. Storage: For best results, do not keep more than 2 months. This ham does not need refrigeration before cooking, but ham will continue to age and may become too highly flavored. Hang in a cool, dry area. The ham may have mold on the surface. This is normal and should be removed by washing in cold water with a brush prior to cooking. The ham can be frozen for a year, which protects against aging and pests, and also inhibits additional mold formation. Once cooked, however, the ham can be refrigerated for up to a week. Cooking: Preheat an oven to 325°F. Scrub ham under cold water with a stiff-bristled brush. Place ham in a roasting pan with the fat side up. Add 4 cups of water, and cover tightly with aluminum foil. Bake Ham in 325°F oven for 4-5 hours or until internal temperature reaches 158°F. Remove the ham from the oven, remove foil, and let ham rest for 15 minutes. Place ham on cutting board and trim all excess skin, leaving 1/4 inch of fat. Carve or glaze as directed below. Glazing(optional): Score fat-cap of cooked, trimmed ham in 1/2 inch crosshatch/diamond pattern, 1/4 inch deep. Rub ham with 1 cup of brown sugar. Stud with whole cloves, and return uncovered ham to a 425°F oven for 12–17 minutes until glazed. Remove from pan and carve as directed below. Carving: With dressed side up, make first cut straight to bone starting at the small end. Use a sharp knife and carve paper-thin slices at 45° angles to the bone. 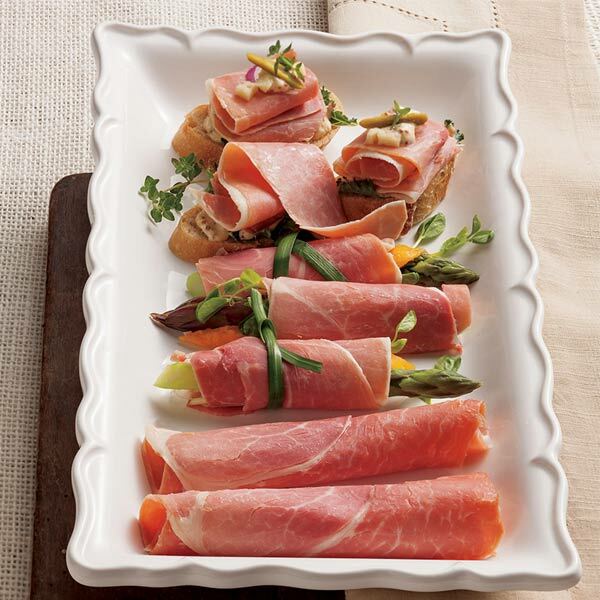 Store cooked ham in the refrigerator for up to 3 weeks or in freezer up to 3 months. Am from Va. and grew up eating this ham. Can't get this in Fl. so I have to order mine online. Luv it! These hams have an exquisite taste. I have ordered 3 hams in the last 5 years (2 years I was not home for Christmas). We always look forward to the ham and sack it comes with. We keep it year round just to remind us how good it smells and tastes. :) Any newbie to a country ham, you HAVE to soak it as recommended or longer. We soaked ours overnight and would recommend to soak maybe 2 nights (with frequent water changes) or 24 hours. It does no good to let it soak in the same water as the water solubility with salt is fixed. It cannot continue to absorb salt. And slice it thin! The cooking and correct preparation is time consuming, but worth it. Ordered this for my Thanksgiving table and was so excited. Ham was SO salty, even though I soaked it to try to pull some of the salt and then removed the skin and used a sweet glaze. It'll be great for beans and soup.... But way too salty for our taste. Going back to the sweet hams for the next ham. Just not a fan of the country ham. Owner Response: Hi Dana, we strive to give our country hams that salty bite that's known for southern, dry-cured country hams. That being said, we want to help if you're dissatisfied. Please feel free to reach out to our customer service team at 800-290-9213 and they'll be happy to help make this right. In the meantime, we highly encourage you check out our Sweet Hams. They aren't dry cured with salt like the country hams, and have a mild, sweet flavor. 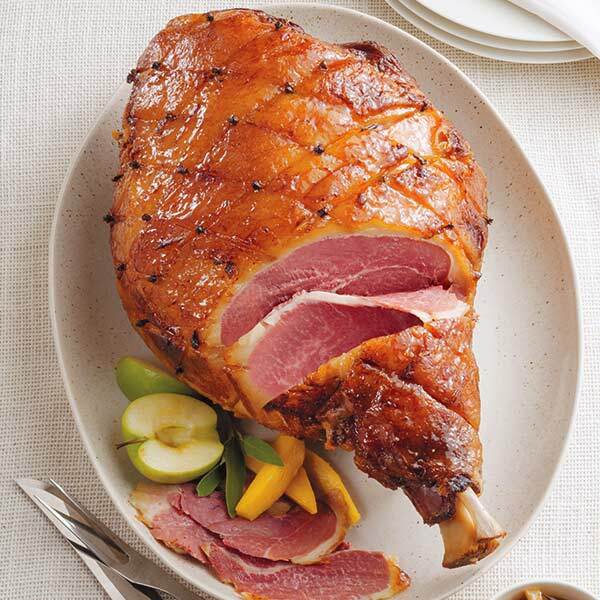 I sent this ham to my friend in Lexington, Ky last year for Thanksgiving....she has her own special process for cooking ham......and people who came are still talking about how delicious this ham it .......going to do it again this year, but it will be a Pre-Thanksgiving celebration. So very glad you are back in operation after the fire. I bought this ham and had it shipped to a friend in Lexington, KY in 2015. She has her own "secret" to cooking hams. The finished product was served to several self acclaimed ham critics, and was unanimously hailed as the best ham ever eaten......bar none. I love giving this ham to friends across the USA who appreciate good hams, and I just follow the ham with a personal visit....so it's a win, win.